Similar to the popular “Neutral Grey” look that recently dropped, the latest take on the popular Jordan Brand model features a white leather base accented by overlays of blue washed suede. The notable detailing on the colorway is the “SP 19 Air Jordan 1 High OG” notation that appears on the medial and lateral midfoot areas. Branding comes in the form of a classic Nike Air tongue tag, side Swooshes and debossed Wings at the ankle collar. Rounding out the design of the shoe is a sail midsole and a contrasting grey rubber outsole. 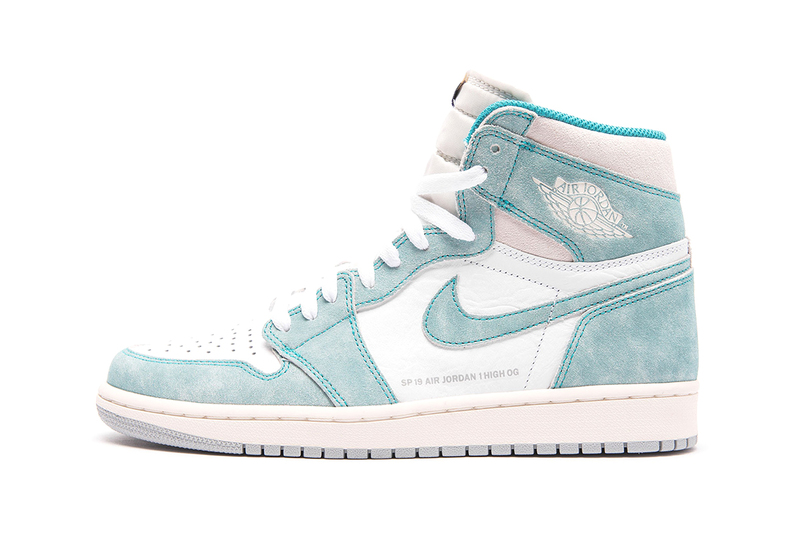 Priced at $160 USD, the Air Jordan 1 Retro High OG “Turbo Green” is set to release February 15 at retailers like Sivasdescalzo. In case you missed it, Jordan Brand unveiled its 2019 NBA All-Star Game uniforms. Mixed-media artworks reflecting a customer-obsessed culture. One more chance at the collaborative gear.